Acquired from the above by the present owner on 24 April 1979. A. Pfannstiel, Modigliani, L'art et la vie, Paris, 1929, p. 22. A. Pfannstiel, Modigliani et son oeuvre, Paris, 1956, p. 81, no. 75. J. Modigliani, Modigliani senza leggenda, Florence, 1958, p. X, no. 38 (illustrated). J. Dalevze, Modigliani, figures, Lausanne, 1960, p. 19 (illustrated in color). J. Lanthemann, Modigliani 1884-1920: catalogue raisonn, sa vie, son oeuvre complet, son art, Barcelona, 1970, p. 115, no. 123 (illustrated, p. 191). A. Ceroni, I dipinti di Modigliani, Milan, 1970, no. 123 (illustrated in color, pl. XVIII). O. Patani, Amedeo Modigliani, Catalogo generale, dipinti, Milan, 1991, p. 142, no. 126 (illustrated in color). Brussels, Palais des Beaux Arts, Modigliani, November 1933, p. 23, no. 33. A photo-certificate from Marc Restellini of the Wildenstein Institute dated Paris, 10 September 1998 accompanies this painting. Around 1910 Victor Libion bought the caf and the butcher shop next door and expanded and remodeled the Rotonde. Libion welcomed the artists and created an atmosphere where all kinds of artists, poets, writers and critics could feel at home. He subscribed to foreign newspapers and let the artists sit for hours over a 20 centimes caf-crme. For the poorer artists, he accepted paintings in exchange for payment and looked the other way when they took rolls from the bread-basket. Thus the back room at the Rotonde became a meeting place where all nationalities mixed freely with each other, something that up till then had not happened in Montparnasse (B. Klver and J. Martin, "Carrefour Vavin," in exh. cat., The Circle of Montparnasse, New York, The Jewish Museum, 1985, p. 70). Pablo Picasso, Marc Chagall, Jacques Lipchitz and other luminaries of Montparnasse comprised Modigiliani's intimate circle of friends. The present work, painted in 1916, is a masterpiece from Modigliani's first period of full artistic maturity. The picture reveals both the key sources of the artist's style, and the unique and original synthesis he made of them. The first influence manifest in the present work is Czanne. 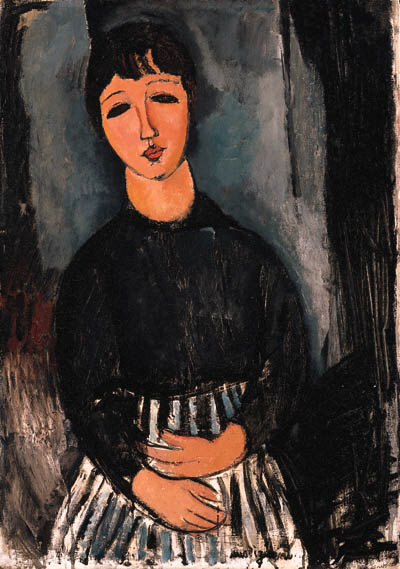 Modigliani adored the pictures of the French painter, and talked passionately of his admiration for them. It is perhaps not an accident that so many of Modigliani's sitters are posed in an armchair with their hands clasped in their laps in the manner of Czanne's portraits of his wife (fig. 1). The third influence evident in the present work is African sculpture. The beautiful stylized head of the woman, with the almond shaped eyes, and the impassive and yet moving expression, was clearly based in part on masks from the Dan tribe (fig. 3). It is striking that Paul Guillaume, Modigliani's principal dealer before June 1916, was also the most important dealer of African sculpture in Paris, and once organized an exhibition that paired Modigliani's paintings and African masks. The emphasis on extreme elegance and powerful styltization in these contemporary influences resonated with Modigliani's life-long love of Italian primitives (fig. 4). He preferred painting on a closely woven canvas, and sometimes when he had finished the work he placed a sheet of paper carefully over the fresh paint to merge the colors. He worked without an easel and with the minimum fuss, plcaing his canvas on a chair and painting quietly. From time to time he would get up and glance critically over his work and look at his models (J. Lipchitz, Modigliani, New York, 1954). His own art was an art of personal feeling. He worked furiously, dashing off drawing after drawing without stopping to correct and ponder. He worked, it seemed, entirely by instinct--which, however, was extremely fine and sensitive, perhaps owing much to his Italian inheritance and his love of the early Renaissance masters. He could not forget his interest in people, and he painted them, so to say, with abandon. This is why Modigiliani... admired African and other primitive arts as as much as any of us... He took from them certain stylistic traits... His was an immediate satisfaction in their strange and novel forms. But he could not permit abstraction to interfere with feeling, to get between him and his subjects. And that is why his portraits are such remarkable characterizations (ibid. ).